Publisher: Pomegranate, Petaluna, California, U.S.A. Most of the black-and-white photographs are interiors and exteriors of the American architect's work, but some are informal shots of Wright at work or leisure 1936-56. Short essays provide personal accounts of particular periods or projects. No bibliography. Available from Pomegranate Artbooks, Box 6099, Rohnert Park, CA 94927-6099. Annotation copyright Book News, Inc. Portland, Or. 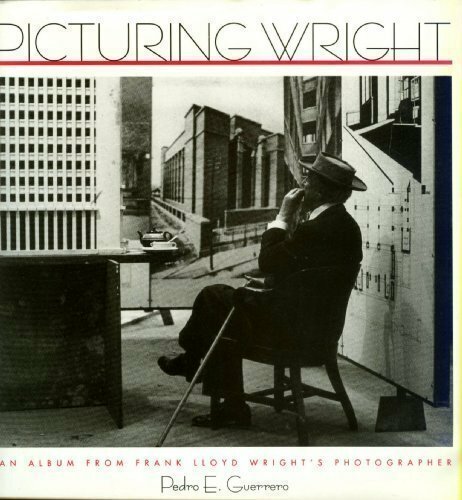 <b>Pedro E. Guerrero </b>(1917&#x2013;2012) spent his career of more than 60 years photographing the most illustrious American architects and artists of the 20th century, the most famous of whom was Frank Lloyd Wright. Following Wright&#x2019;s death, Guerrero went on to document the groundbreaking modernist works of Marcel Breuer, Philip Johnson and Edward Durell Stone, as well as such legendary figures as Alexander Calder, Louise Nevelson, John Huston, Julia Child and Alexey Brodovich.<br /> &nbsp;<br /><b> Martin Filler</b> (foreword) is an American architecture critic who has been a contributor to The New York Review of Books since 1985.&nbsp; His writing on modern architecture has been published in more than 30 journals, magazines and newspapers in the U.S., Europe and Japan.&nbsp; He is the author of Makers of Modern Architecture: From Frank Lloyd Wright to Frank Gehry (2007) and Makers of Modern Architecture, Volume II: From Le Corbusier to Rem Koolhaas (2013).<br /> &nbsp;<br /><b> Dixie Legler Guerrero</b> (afterword), who married Pedro Guerrero in 2008, was the founder and editor of the <i>Frank Lloyd Wright Quarterly</i> for the Frank Lloyd Wright Foundation. She is the author of several books, including <i>Frank Lloyd Wright: The Western Work</i> (1999) and <i>Prairie Style: Houses and Gardens by Frank Lloyd Wright and the Prairie School</i> (1999).